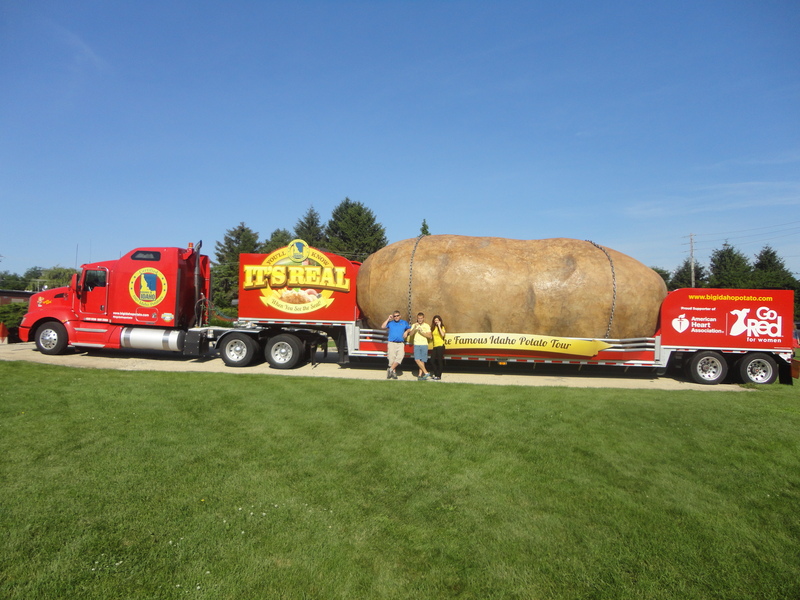 When my daughter who works for the American Heart Association called me up and asked me if I would like to go to Champaign to cover the Big Idaho Potato Truck for Farm World, I couldn’t imagine what I would see. In my wildest imagination I never pictured the semi trailer with a potato in the center and the AHA’s Go Red for Women message ‘Take care of your heart’ at the rear. The 48’ long flat bed trailer holds an Idaho potato that is 28 ‘long, 12’ wide and 11.5’ tall. It was built in Weiser, Idaho and took nearly a year to build. The potato weighs 12,130 pounds which is equal to 32,346 medium sized Idaho potatoes. Parked June 25, 2014 in front of the Champaign radio stations NewsTalk 1400, Lite Rock 97.5 and Classic Hits 107.9 no one could miss it. The cost of the truck was the same as two 20 second TV commercials and Larry said the truck so far has generated much for press about the potato and has been very successful in getting people talking. Larry Bathe said every time the truck stops it is an event whether getting gas or stopping for lunch. The Potato Truck will visit 26 states and travel close to 19,000 miles. It will stop at high traffic events like the Kentucky Derby, the Art Car Parade and Festival in Houston, TX and the 55th World Lumberjack Competition in Hayward, WI. If you didn’t get a chance to see it, they are making a return stop at the landmark Brooks catsup bottle water tower in Collinsville, Illinois, on Tuesday, July 1, 2014. For details about the Idaho Potato Truck, check out their Facebook Page at https://www.facebook.com/BigIdahoPotatoTour/timeline.